This is one of my favourite units in the game, the infamous Poison Wind Globadiers! I like them so much that I am using a Gnawdoom as their team champion. I could not miss the chance to paint him again. 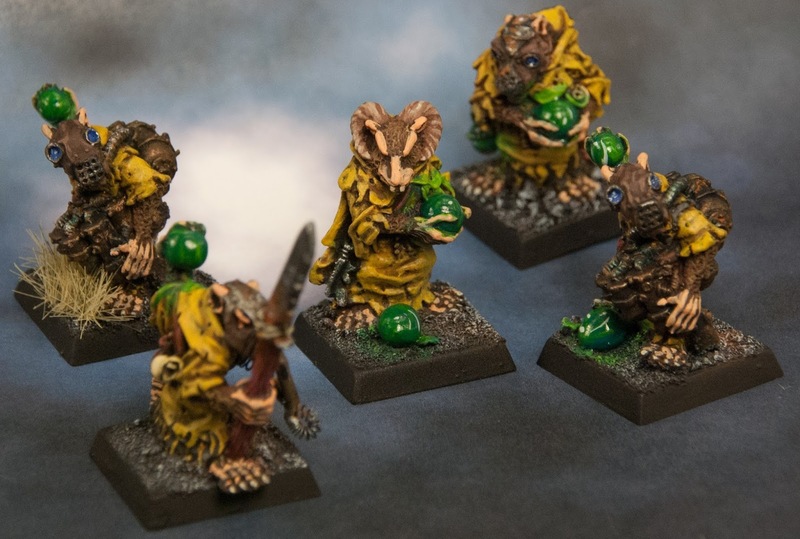 I have used a slightly different colour approach for these skavens. 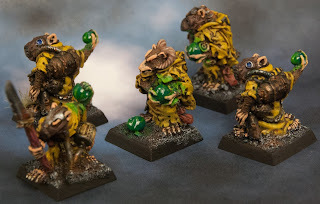 I mixed green to paint all of the furs and skins, it is very difficult to see in these pictures, but when you put them next to others in the army, you can notice. As for the poison globes, they were painted in a much darker tone compared to the other ones carried by regular troops, like the one carried by the other Gnawdoom. Several layers of glossy varnish were added to accomplish the effect. You may have notice that all Warpfire Throwers, Jezzails and Gobladiers are painted in the same colours. 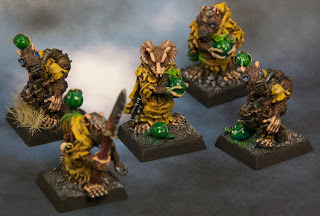 I decided that all rats from Clan Skryre will wear yellow rags with black flames. I saw this colour scheme on Nico's army and I decided to copy it as I think it looks great. Unfortunately the unit has only five members, but I am looking to add a new one, as I want to have a total of six to be able to field two units of three. These guys add 125 points for 3rd ed. and 100 for 4th ed.